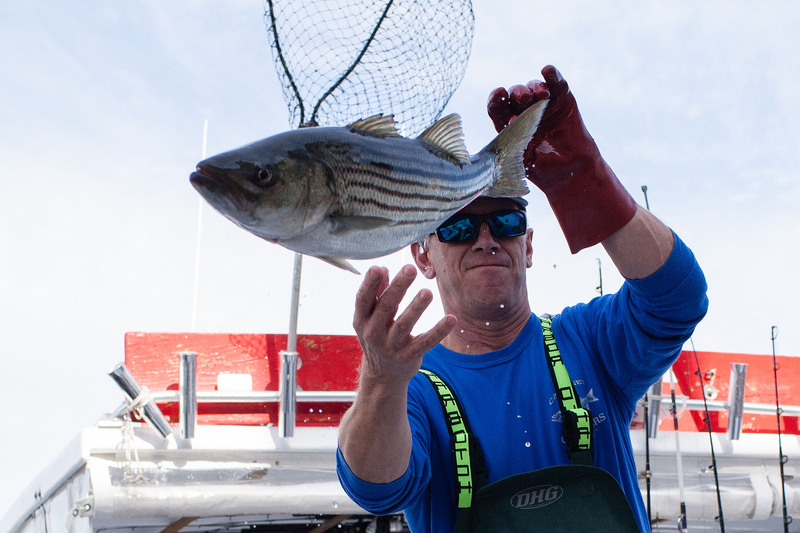 Also known as rockfish, striped bass are recovering from a severe decline in the 1970s and 80s with the help of fishery management practices and Chesapeake Bay restoration. 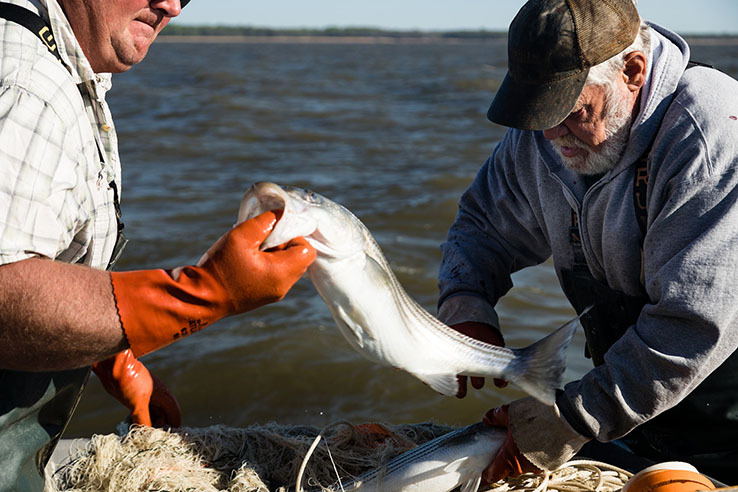 Striped bass—also known as rockfish or stripers—have been one of the most sought-after commercial and recreational fish in the Chesapeake Bay since colonial times. After bouncing back from a severe decline in the 1970s and 1980s, the striped bass population remains around target levels, with year to year fluctuations depending on fishing pressure and environmental conditions. However, the health of the species is greatly dependent on the health of the Bay, which provides forage fish as prey and healthy habitats for feeding, spawning, and nursery grounds. Why are striped bass important? Striped bass are a key predator in the Chesapeake Bay food web. They also support one of the Bay's most popular commercial and recreational fisheries. Striped bass are one of the top predators in the Chesapeake Bay food web. As a result, they must have enough prey—primarily small forage fish including menhaden and bay anchovies—available to them to keep their population healthy and the food web in balance. Strong fluctuations in the number of striped bass in the Bay could cause cascading changes throughout the rest of the food web. Striped bass is a popular commercial and recreational fish species in the Chesapeake Bay. Its size, fighting ability and delicious taste makes rockfish one of the top sport fish in the Bay and on local restaurant menus. "Whereas, In the judgment of the members of the General Assembly of Maryland, it is a simple act of justice and of equity that this fine old Maryland fish should be honored by being designated as the official fish of the State of Maryland..."
Why did striped bass numbers decline in the 1970s and 1980s? The striped bass fishery experienced record-high catches in the early 1970s; in 1973, the commercial fishery landed 14.7 million pounds. But following that year, reported commercial and recreational catches declined steeply. By 1983, the striped harvest had fallen to just 1.7 million pounds. Water temperature fluctuations in spawning grounds. Low dissolved oxygen in deeper Bay waters, which eliminated much of the fish's summer habitat. Acidity and chemical contaminants in certain spawning areas. Poor water quality from runoff from the land and sewage treatment practices. In response to this downturn, Congress passed the Atlantic Striped Bass Conservation Act in 1984. Maryland and Delaware imposed fishing moratoria on striped bass from 1985 through 1989, and Virginia imposed a one-year moratorium in 1989. The Chesapeake fishery reopened in 1990, after three-year average recruitment levels exceeded an established threshold value. Since that time, the striped bass population in the Bay has dramatically increased, likely because of responsible, adaptive management coast-wide and suitable environmental conditions. In 1995, the population had increased to the point where striped bass was considered restored. In the years since, catches varied from year to year, mostly remaining within a healthy range. What issues currently threaten striped bass? 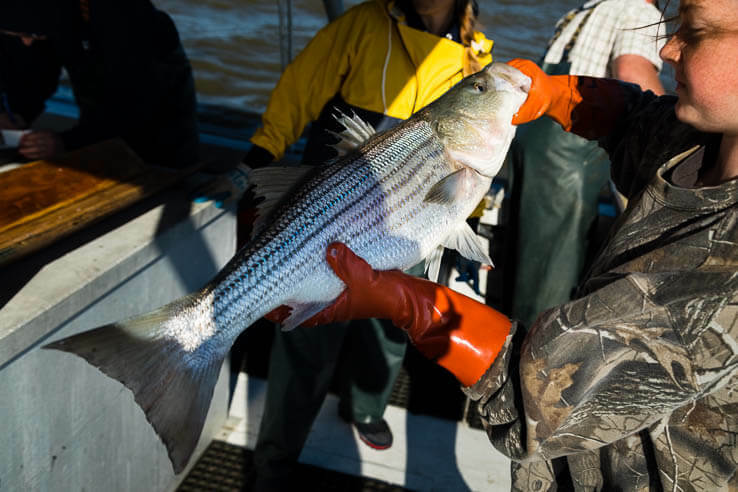 A number of environmental challenges in the Chesapeake Bay threaten striped bass, including habitat loss, lack of prey, pollution, hypoxia (low oxygen) and disease. Climate-driven changes in temperature and rain patterns may further impact striped bass’ ability to bounce back from declines. When multiple stressors are present at the same time, such as warmer waters with low oxygen, striped bass are even more vulnerable to disease and mortality. Scientists hope to better understand the conditions that lead to a good year or a bad year for striped bass. Loss of high-quality habitat areas is a problem for striped bass spawning and survival of young. Urban development and farming in the watershed contributes to poor water quality and loss of structured habitat, such as seagrasses. Seagrass beds are an example of important nursery habitat for juvenile striped bass. Protecting striped bass also requires protecting the nearshore environments where the fish spend time avoiding predators and feeding on prey. Researchers are concerned about whether there is enough prey to adequately support the striped bass population. 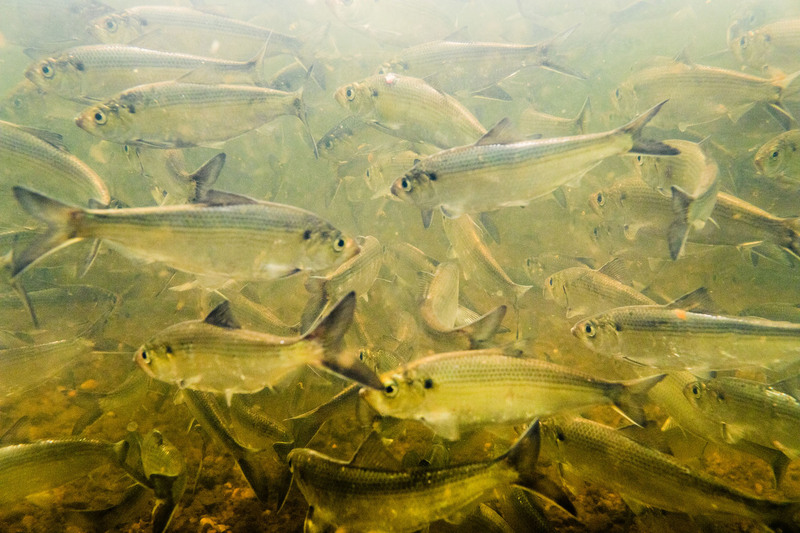 Availability of forage fish, like menhaden and bay anchovies, is an important factor in striped bass abundance and growth. Declines of prey species may be leading to a lack of food and slower growth rates in striped bass. Scientists are concerned about the high prevalence of a disease called mycobacteriosis among Bay striped bass. Since the late 1990s, researchers have documented an increased occurrence of external lesions associated with mycobacteriosis on striped bass. 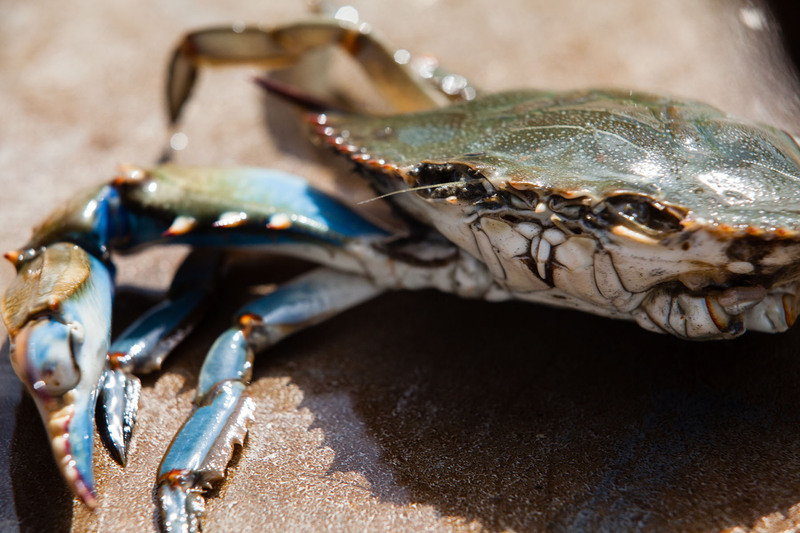 In response, Maryland striped bass disease monitoring data was used to investigate the potential connection between mycobateriosis and environmental conditions such as water quality. Findings of the study suggest that the proportion of fish that test positive for the disease is correlated with water quality, and that the prevalence of mycobateriosis seems to increase as nitrogen, phosphorus and sediment pollution increases. 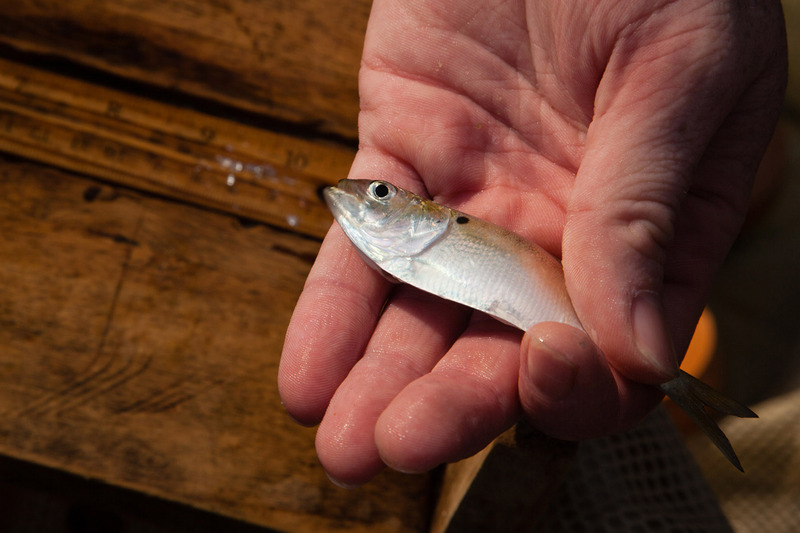 Efforts to reduce nutrient and sediment loads play a critical role in striped bass recovery. How are striped bass managed? The recent history of striped bass in the Bay—full population restoration after steep declines in the 1970s and 1980s—represents an ongoing management effort with many partners involved. However, the current status of Bay striped bass illustrates the need for fisheries managers to take an ecosystem-based approach taking into account a fish species' whole ecosystem, such as interactions with other species and pollution and other stressors. Continuing research and restoration efforts remain critically important to the future of the species, as the Bay is the primary spawning and nursery area for 70 to 90 percent of the Atlantic striped bass stock. Striped bass are managed by the Atlantic States Marine Fishery Commission (ASMFC), which coordinates among Atlantic coastal states to set regulations based on the best available science. Developing regulations to allocate and control safe harvest levels. Determining stock assessment and research needs. Examining the effects of environmental conditions, such as habitats and water quality, on striped bass stocks. Install a green roof, rain garden or rain barrel to capture and absorb rainfall. Use porous surfaces like gravel or pavers in place of asphalt or concrete. Redirect home downspouts onto grass or gravel rather than paved driveways or sidewalks. If possible, install living shorelines to stabilize waterfront property without damaging seagrass beds and other nearshore habitats. What is the status of striped bass in the Chesapeake Bay? After steep declines in the 1970s and 1980s, the current status of striped bass in the Bay represents a management success story. But uncertainties about the health of the Bay's striped bass mean continuing research and restoration are still critically important. What role do striped bass play in the Chesapeake Bay food web? Striped bass are one of the top predators in the Chesapeake Bay, helping to keep the food web in balance. Changes in the number of striped bass in the Bay could have cascading effects throughout the rest of the food web. The amount of oxygen that is present in the water. It is measured in units of milligrams per liter (mg/L), or the milligrams of oxygen dissolved in a liter of water. Just like humans, all of the Bay’s living creatures need oxygen to survive. A natural unit formed by the interaction of a community of plants and animals with the environment in which they live. All of the elements of an ecosystem interact with each other in some way, depending on each other directly or indirectly. A food chain is formed as one organism eats another. A food web is a system of interlocking and interdependent food chains, in which each organism supplies energy to another life form. An infectious disease that causes inflammation, tissue destruction and the formation of scar tissue in the organs of striped bass. An animal that hunts for and eats other plants or animals. A plant or animal that is hunted for and eaten by a predator.